DANBURY - John Conroy found himself in almost the exact same position Tuesday afternoon at the Connecticut Mid-Amateur Championship as he did in 2017 - at the top of the leaderboard heading to the final hole. This time, it ended much differently - in a good way. The Berlin native came to the final hole last year three shots ahead, but made a triple bogey and lost the tournament in a playoff. On Tuesday, Conroy made sure he had a little more wiggle room and took a 6-stroke lead to his final hole, not that he needed it. 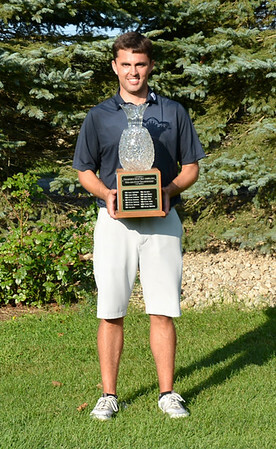 Conory shot a 5-under 72 to close out the tournament at 6-under par to win Mid-Amateur Championship at Richter Park, becoming one of only three players in state history to win both the Mid-Amateur and the Amateur. The two players to do it before him, Bill Hermanson (who tied for third Tuesday) and Jeff Hedden, are both in the Connecticut Golf Hall of Fame. The next closest to Conroy was James Sheltman, who finished at 1-over. It helped Conroy was able to get out to a quick start despite the heat and humidity that caused several players to withdraw and sent scores on the second round of the day soaring. He made two eagles and a birdie in his first eight holes and separated himself from the field that no one in the afternoon got closer than four shots. But Conroy three-putted to start the back nine before settling back in. He also birdied 17, ending any chance of a late comeback from a challenger. Posted in New Britain Herald, Berlin on Thursday, 30 August 2018 18:19. Updated: Thursday, 30 August 2018 18:21.